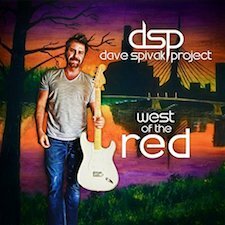 Although he currently lives in Calgary, Dave Spivak’s early life in Winnipeg and time spent in Traverse Bay create the backdrop for his album West of the Red. “Basically, I’ve been told it’s a very Canadian sound,” the singer/songwriter/guitarist says of the record produced at Bedside Studios by Winnipeg mainstay Len Milne. One could also describe it as “heavy roots music,” and it does by all means get heavy. West of the Red opens with the electric rocker “Breakfast for One.” Bluesy keyboards highlighting the guitar riffs add a nice late-‘60s-inspired touch. Spivak’s voice has the right amount of rasp and attitude to it, as he sings about a worn out relationship that needs to be put out of its misery. Lyrics like, “We drove that crooked ditch ‘til the bottom fell out,” set the tone for West of the Red. Others such as, “I’m not riding that Gravitron / Not this or any year,” show Dave’s sense of humor. The humor fades during West of the Red’s second track. "Get Outta My House" is dark, ominous, and deeply personal. The layers of electric and acoustic guitar blend well to create a chilling vibe. The main electric riff is memorable, and the solo—which is a total jam—really builds on it. The lyric, “The ghost in her face told me that I should run / But I stayed too long the way always do,” perfectly captures the feeling of looking back at all the red flags in a long-term relationship. “The King is Dead,” which is built around a prominent acoustic guitar riff, proclaims, “Rock ‘n’ roll is dead / It’s just not for the people anymore.” It tells of a guy who has obviously fallen on some hard times, and going to a rock show seems unattainable. The backing vocals are cool on this one, especially the female sung harmonies that create a trippy turn at end of the chorus. Heaviness and a harder rock sound creep back in with “Cold Empty Streets.” Slightly distorted vocals and some subtle feedback help set the mood for this one. Though it is never explicitly mentioned, the city of Winnipeg is captured by hints about “where the two rivers meet,” River Avenue, trains, bridges, and the bitter cold. The angry, vengeful lyrics paint a picture of a bleak place. The bass line is strong, and the bluesy rock guitar solo ties it all together. West of the Red is an eclectic mix of roots rock ranging from the folkier end of the spectrum on over to the harder side. Dave Spivak’s experiences in Winnipeg, Traverse Bay, and beyond, have inspired meaningful, memorable, and authentic songs that are uniquely his. The Dave Spivak Project is currently booking shows and performing in Western Canada. DSP will also be a special guest on Chris Jericho’s Rock N Wrestling Rager at Sea. Check out DSP on Facebook and Twitter. After their longest ever gap in between albums, shock rock icons W.A.S.P. have released their 15th studio album, Golgotha. This long awaited follow-up to 2009's Babylon is named for what is commonly referred to as Calvary or "The Place of the Skull" - the area outside of Jerusalem where Jesus Christ was crucified according to the Gospels. W.A.S.P. 's notorious leader, Blackie Lawless, has been pretty forthright about embracing religion on the past few albums, and this one is no different. He produced this album, as he has most of the band's albums. 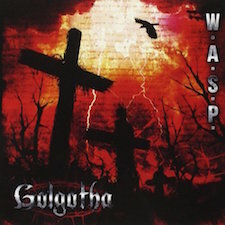 Golgotha is the band's first for Napalm Records, and W.A.S.P. 's line-up has stayed constant since their 2007 Dominator record. However, drummer Mike Dupke left the band upon the release of Golgotha. "Scream" opens Golgotha, and this hard rocker with a classic metal sound is perfect for this purpose. It's a surprisingly fun song for an album with otherwise heavy subject matter, and the chorus of "Come make it scream if you love me / And make it bleed if you want me," is catchy. The rest of the song is filled with religious imagery, such as mentions of graven idols, prayer, and gods. "Scream" is a great choice for an album opener, and it would made a killer opener for a concert as well. Other rockers such as "Last Runaway" and "Shotgun" follow. "Last Runaway" features strong bass playing from Mike Duda and lyrics about embarking upon the rock 'n' roll glory days and then coming home to rest. It also alludes to an autobiographical tale of redemption in which Blackie Lawless lives a rough rock star life and later turns to God. "Shotgun" is highly rhythmic and has a big, bright '80s sound to it. The subject matter is more socio-political than religious. The line, "Grab a torch, a pitchfork, and get your guns," tells of a political uprising. In the chorus, the cheesiness of the line "Tonight, got a rock 'n' roll shotgun," makes me take it a little less seriously though. There are several negative mentions of a king in the lyrics, and I'm thinking it may be a jab at U.S. President Obama. "Miss You" is the heart wrenching ballad that follows several heavy and energetic rock tracks. It is highly emotional, and Blackie's vocals are top notch, and Doug Blair's guitar solo is fantastic. However, it clocks in at 7:42, which is about three and a half minutes too long. By the end of "Miss You," I groaned to myself, "I get it. He misses somebody". "Fallen Under" starts off slowly, and you think it's going to be another ballad that hopefully doesn't drag on like "Miss You." It ends up being more of a mid-tempo song and one of the best on Golgotha. The line just before the chorus, "Save me from crawling in darkness / Save me so blind," is memorable and something you'll be waiting for each time you listen to the album. "Fallen Under" is heavily based on religion, as Blackie is begging for Christ's salvation as he sings. It also contains lyrical themes of slavery and chains that carry over into the next track, "Slaves of the New World Order." It opens with ominous "oohs" that show a nice side of Blackie's vocal range, and the guitar riffs are quite reminiscent of Iron Maiden. I even initially heard the opening line as, "Show me the Brave New World," and thought "Woah, that really is like Maiden!" After further research, it appears the line is "Grave New World." "Slaves of the New World Order" is one of the longer songs on Golgotha, just a couple of seconds longer than "Miss You." It's almost a multi-movement kind of thing with a lot of variation, so it does not get boring. The album ends with its title track "Golgotha." "Golgotha" begins slowly with subtle synth sounds, but it builds into a heavy rocker. It is very openly religious, possibly even more so than previous tracks, "Eyes of My Maker" and "Hero of the World." The chorus of "Jesus I need you now / Free me I'm lost somehow," is a sincere plea for salvation. Because of the song's title and the line, "Are you who they say you are?" this song would be fascinating for someone who is spiritual, or at least intrigued by the Crucifixion, to further reflect on during Holy Week before Easter. Golgotha is a great modern album from a classic metal band. It should not be dismissed as a lame "Blackie cleaned up and found Jesus" sort of thing. Golgotha is certainly heavy and dark, and the blood, guts, skulls, and other more violent aspects of the Bible have proven to be be very "metal." The Christian imagery that is presented by W.A.S.P. on Golgotha is very well done and fits well with the band's hard rock style. On the heels of 2013's Onyx, which spawned the three #1 U.S. Mainstream Rock singles, "Trenches", "Deal With the Devil", and "Torn to Pieces" and then "Beautiful" which was still charting earlier this year, Pop Evil is on top again with their latest release, Up. The lead single and track that opens Up is "Footsteps". The song takes some time to build, with its 40-second intro made up of some distorted echoes and electronic effects that are somewhat difficult to describe. Leigh Kakaty's vocals kick in, then so do the drums, and shortly thereafter, the bass--courtesy of Chachi Riot and Matt DiRito, respectively. The guitar-driven hard rock element does not become prevalent until the first chorus, which has a highly memorable "woooooo" to it. "Footsteps" has a catchy pop sensibility to it, and it boasts lyrics about knowing you are destined for something greater. 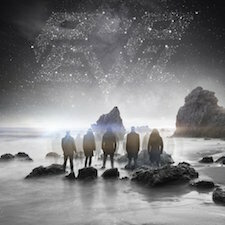 "Core" follows, and with its heavy bass and big riffs, it is much more of the hard rock you would expect from Pop Evil. The lyrics "You can't hold me down / You don't own me / You're done to me," perfectly sum up the song's attitude. "Core" also has a great guitar solo with some thick bass layered on top. In a similar vein, "Take It All" has classic hard rock-inspired riffs in the intro. The repetitive "I'm comin' gonna take it all / I'm comin' gonna take it all" in the chorus leaves a lasting impression. Kakaty's vocals are aggressive, and there is also good use of backing vocals from the other band members. Although it's not the heaviest song on the album, and it's definitely not a ballad either, "Ghost of Muskegon"--which is named after a city in the band's home state of Michigan--is absolutely my favourite track from Up. It's one of those songs that immediately draws you in, and I could see this one as a potential single. The beginning is rhythmic, with some slight electronic elements to the beat. The vocals are fantastic as Leigh Kakaty sings the chorus of "I'm just a ghost / It's starting to show / I've been on the wrong side searching for love," in such a hard-hitting and profound way. As Up rolls along, "Lux" is the heaviest song as of yet, especially with its thick bass intro. It has a sexiness to it, as the lyrics tell the story of a likely enticing woman, "She got me walkin' on a thin line / She said 'Come come over to the dark side'." "Vendetta" shows even more of Pop Evil's metal side with its thrash-inspired opening riffs. Its verses are quite rhythmic and forceful, but "Vendetta's" melodic, powerful chorus is primed for rock radio. "Dead in the Water" is another favourite, as it begins with bright NWOBHM-style intro riffs, followed by more bombastic modern metal riffs. Much like "Vendetta" the verses are aggressive, but the chorus is catchy and lyric-driven. The muffled vocals on the bridge are so fitting, as it cleverly simulates drowning. "Dead in the Water" is an eclectic song with many elements that mesh together perfectly. As it slowly and quietly ends, it fades into the ballads that create finishing touches for Up. Up ends with two ballads, but they are at opposite ends of the spectrum. The first is "Seattle Rain," which is an acoustic country-flavoured track with hints of mandolin. It is unlike anything else Pop Evil has ever done, but it is beautiful and sincere. Then, with "Til Kingdom Come," the album is done. It is heavy on the bass, and the chorus is filled with the remarkable guitar work of Nick Fuelling and Dave Grahs. Although it is slower, it is still pretty heavy, and it ends at a climax of squealing guitar riffs. When Pop Evil is ready to unleash a ballad from Up as a single, I'd bet money this will be the one. Pop Evil's Up is a diverse record with no shortage of hard and heavy rock moments--but also balanced with ballads and a touch of pop nuance. Each track is catchy and memorable, and most--if not all--are worthy of being future singles, particularly rockers "Ghost of Muskegon" and "Vendetta" and ballad "Til Kingdom Come". Since they all can't be on the radio--even though they probably should--rock fans should do themselves a huge favour and get Up. Germany's three-piece retro rock outfit Kadavar continues to dig down to the earliest roots of hard rock and heavy metal with their latest release, Berlin. 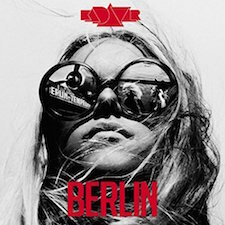 Named for where the band was formed and found a great deal of influence, Berlin is Kadavar's third studio album and the follow-up to 2013's Abra Kadavar and 2014's Live in Antwerp. It is the first full album of new material with bassist Simon "Dragon" Bouteloup, who played on part of the previous one after original member Philip "Mammoth" Lippitz left. Berlin, which was in fact recorded there, begins with the energetic track "Lord of the Sky". The guitar riffs instantly hearken back to the '70s and are reminiscent of the earliest KISS records. It's just a little less dimensional since there is only one guitarist in this case. The vocals are okay, and they definitely aren't my favourite aspect of the song. Christoph "Lupus" Lindemann is not a vocal powerhouse like the legends from the era Kadavar is trying to recreate. He's also the band's guitarist, so those skills do make up for that. "Last Living Dinosaur" is one of the album's singles for which band has made a video. It starts slowly and steadily but gains a heavier energy just before the vocals kick in. It's not as upbeat as "Lord of the Sky," and it has a thick Black Sabbath feel to it, with a hint of Blue Öyster Cult. Lindemann's singing improves a bit for "Last Living Dinousaur," as his style and cadence becomes imitative of a young Ozzy Osbourne. While still very much retro rock, "Pale Blue Eyes" and "See the World with Your Own Eyes" go in a different direction, taking on a slightly earlier era. "Pale Blue Eyes" boasts electrifying intro riffs and has a fuzzy Hendrix vibe. It is rhythmic and catchy, and the chorus of, "Mysterious lady in you purple dress you look so fine / I want to have you by my side / Mysterious lady whatcha doing with your pale blue eyes? / I can't get you out of my mind," is memorable. The guitar solo in "Pale Blue Eyes" is fantastic, and it seems to be one of the most authentic moments on the album. Similarly, "See the World with Your Own Eyes" is super '60s. Right from the start you can hear the Rolling Stones influence, and it is also evocative of the Eric Burdon & War song "Spill the Wine." "The Old Man," another single with a (fittingly pre-MTV looking) music video, is a wonderful re-creation of early metal. The repetitive guitar riff has the familiarity of Black Sabbath and Iron Maiden. I would consider it the darkest song on Berlin, and while the song is near perfect I have mixed feelings about Christoph Lindemann's often muffled voice meshing with the song. I would love to hear it be sung by someone a little more sinister. An Alice Cooper or Ozzy type would fit well with the darkness of "The Old Man". Lindemann might want to revisit his vocal performance on "Last Living Dinosaur". Finishing out Berlin is the rapid rocker "Into the Night". With its heavy drumming from Christoph "Tiger" Bartelt, this track pays tribute to the pre-thrash proto-punk of Iggy & The Stooges and The MC5. "Into the Night" slows down toward the end, making what was once a brash garage rock song much more melodic. This serves as a good transition to the bonus track, "Reich der Träume." Originally by Velvet Underground/Andy Warhol collaborator and heroin chic fashion model Nico, "Reich der Träume" is the only song on Berlin that is in German, despite the fact that the band is German. It is ethereal and contains space age electronic sound effects. Although the rest of Berlin is so guitar heavy, a fuzzy hard rock guitar only makes a brief appearance in the middle of "Reich der Träume". However, the bass is so deep in parts you can practically feel it rattle your chest. Berlin seems to be less blues-based than Kadavar's previous offering Abra Kadavar, and the band is bent more toward a fuzzy, weighty, garage rock sound. The vocals were better on the last record, as they were stronger and more soulful, and the lyrics could be heard a little more clearly. The abundance of solid, prime hard rock riffs make that easy to overlook. I personally like when Kadavar leans toward the Sabbath end of the spectrum, but I can appreciate that they do not necessarily stick to one facet of the '60s and '70s period of heavy rock 'n' roll.